The city of Denton’s landfill now produces twice as much methane as it used to—and that’s a good thing. Civil engineers Sahadat Hossain and Melanie Sattler are using a process known as enhanced leachate recirculation (ELR) to add moisture into the landfill, thereby increasing the amount of methane produced by the decomposing waste. The landfill’s collection system then gathers the resulting gas and delivers it to an electricity-generation plant to help provide power to 1,600 homes in the city. 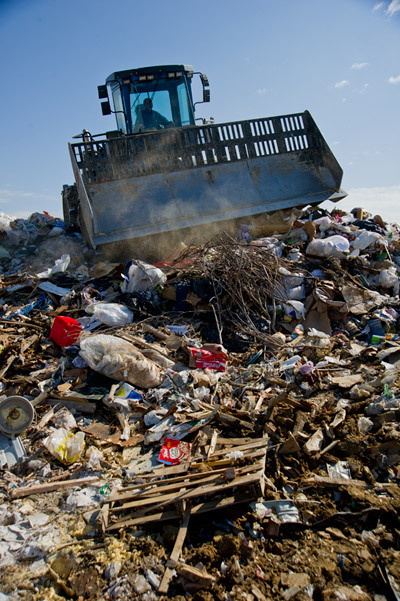 Adding water to a landfill can help it produce gas more efficiently. 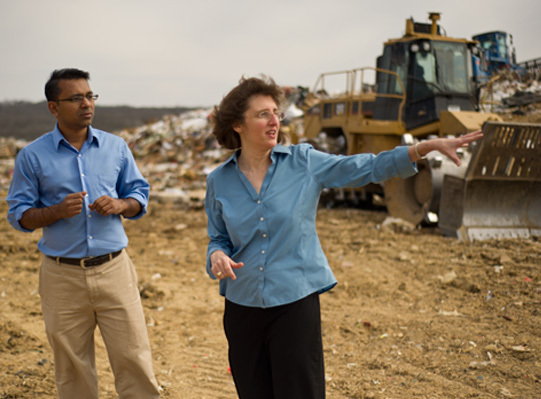 When it comes to landfills, Dr. Hossain explains, there are two methods of operation. The first is the conventional method: “basically putting waste in a landfill and then covering it with dirt,” the associate professor says. The waste is kept dry, which limits the leachate—the contaminated water percolating in the waste. This causes natural decay to occur much more slowly, and therefore produces less methane. The second way is the one he and Dr. Sattler employ: adding water to the landfill. Typically, leachate is pumped out of the landfill. But Hossain and Sattler’s system circulates the leachate back into the landfill and supplies additional water. “By adding water and operating the landfill in this way, we produce more gas in a shorter amount of time,” he explains. For the ELR process to work, monitoring the amount and location of moisture in the waste—a tricky task—is key. Hossain uses a new tool called the resistivity imaging (RI) method, which simplifies the process and helps landfill managers know how effectively the system is working. This may eliminate the need for destructive sampling and drilling. We’re responding to regional and national needs. We’re helping city, local, and federal governments—helping all the public with these projects. “Our system is the first in the world to find moisture distribution and quantification of moisture,” he says. If Denton is successful in its effort to receive a permit modification from the Texas Commission on Environmental Quality to use RI instead of drilling, it could potentially impact all landfills in the state. Sattler’s involvement in the project began in its second phase: monitoring the levels of methane and researching how to capture as much of it as possible. The cover soil typically used to seal in landfills is methane-permeable, so the goal is to prevent “fugitive emissions” of the gas, which can contribute to climate change (it has 25 times higher global-warming potential than carbon dioxide). Civil engineering Ph.D. student Sonia Samir, who researches these fugitive emissions, hopes she soon can determine what type of cover system works best and how to improve the efficiency of the existing gas-collection system. The team began experimenting with different cover materials at the landfill this fall. Although Sattler’s field is environmental engineering with expertise in air quality, she says she transitioned naturally into renewable energy projects. The ELR process at the Denton landfill is not new. Bioreactor landfills like this are already operational in Florida, Wisconsin, and Minnesota. But it is the first in Texas. In 2012 the city extended its contract with the researchers for another three years and $344,414. Plans to add two more generators should triple the plant’s electrical output from methane, and the city provided a building near the landfill to serve as a center for the researchers. Sahadat Hossain and Melanie Sattler's ELR process is being incorporated at landfills in Denton, Garland, and Corpus Christi. Following Denton's example, Garland, too, is incorporating Hossain and Sattler’s model, and the researchers have a three-year contract with Corpus Christi to incorporate the ELR system in its landfill. Hossain and Sattler will help design, implement, and monitor the system’s performance for the later project. Additionally, the pair recently won a $100,000 grant through the Environmental Protection Agency's Global Methane Initiative to study the feasibility of a landfill-gas-to-energy system in Ghana, the western Africa country. Projects like the Denton landfill are just one example of UT Arlington’s comprehensive investment in sustainability. Other efforts include on-campus recycling bins, ride-share programs, and LEED-certified buildings such as College Park Center and the Engineering Research Building. The University’s Office of Sustainability initiates and develops many projects and supports education and outreach. Sattler and Samir praise UT Arlington for its support of their work and for its strong commitment to sustainability in general. Civil Engineering Department Chair Ali Abolmaali says the department is doing its share, setting up two sustainable centers and hiring faculty who can assist with research and outreach.